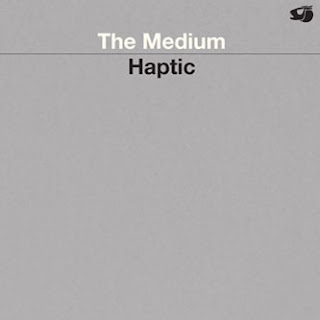 I understand it's early yet, but "The Medium" is the most enjoyable new release I've heard thus far in 2009. Issued as an LP with Haptic (Steven Hess, Joseph Clayton Mills and Adam Sonderberg) joined on Side One by Tony Buck and Boris Hauf and on Side two by Olivia Block, recorded in 2005 and 2007 respectively. Side One is semi-dronish in nature, though richly layered and accompanied by all sorts of roughage. There's a fairly steady wash of brushes on cymbals and snares, mixed in with a range of organ-like tones and lower synth-y throbs. Those higher tones (hard to source--a guitar maybe?) coalesce into a simple but eerie three note descending pattern that becomes the spine of the piece, iterated languidly throughout. Rich, ringing, growling and gorgeous. As fine as that is, it's on Side Two that some greater degree of depth is reached. Less steady-state, more a series of sound episodes emerging from a fog in irregular patterns. But the main new element comes from Block. I think I'm safe in assuming the source, as the muffled, vaguely sub-aqueous thuds and jostlings are not dissimilar from the sounds encountered in her (excellent) "Heave To" from around the same time. Combined with the again rich but subdued electronics and mallet-struck gongs, it creates a very mysterious, enormously evocative sound world, dark and mist-laden, filled with large objects just on the edge of identification. Crackling fire (?) and other detritus float past. Does anyone recall John Calvin Batchelor's amazing novel, "The Birth of the People's Republic of Antarctica"? (1983, before he oddly morphed into a radio host). If they ever film it, here's the soundtrack. The Medium is a fantastic recording! I was lucky enough to be at the record release event where Haptic played with a live video by Lisa Slodki. Get this while you still can.